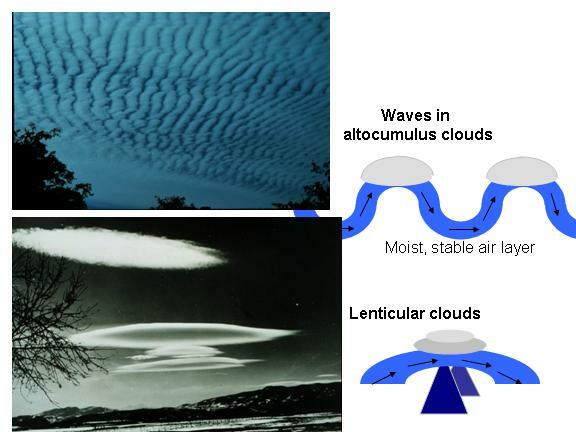 While "wave cloud" is not a specific type of cloud, a few clouds do sometimes form wave patterns. One reason for wave patterns in clouds is when they form in a stable layer, that is a thin layer of the atmosphere where the temperature doesn't decrease very much with height, or even increases with height. Any disturbance in this layer can cause waves of air to move along it, like water waves in a pond. If the layer happens to be humid enough, then where the air is flowing up a crest of the wave, a cloud forms, and where it is flowing down the crest, the cloud evaporates. This leads to the wave structures, as are pictured above. Another way that wave clouds can form is where air flows over a mountain or hill. If a cloud forms on this wave, it is called a "lenticular" (which means "lens-shaped") cloud, which has a very smooth, symmetric appearance.